Submitted by Anonymous on July 12, 2006 - 6:59pm. Submitted by ashiezorz on February 20, 2014 - 4:37pm. Submitted by Chiomi on May 18, 2008 - 4:25pm. But yeah, that's why I don't leave campus anymore. We have a campus coffee house that has study night on Wednesdays, and the coffee is free and endless. Submitted by Jam on May 18, 2008 - 6:11pm. 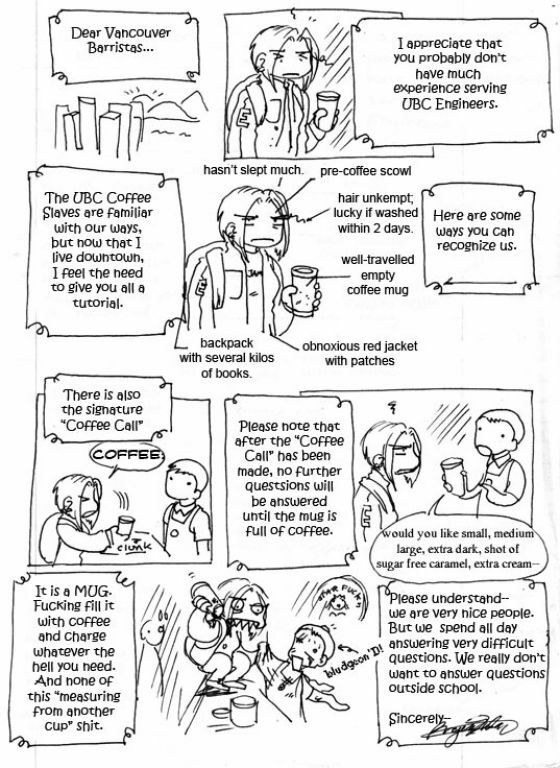 Chiomi wrote:We have a campus coffee house that has study night on Wednesdays, and the coffee is free and endless. Oh man they would NEVER get rid of UBC students if they did that here. They actually post "no studying" signs in most of the eateries! Submitted by Radikal on September 6, 2008 - 6:05pm. Submitted by Kira on February 2, 2009 - 10:44am. Submitted by candeh on March 26, 2009 - 10:42pm. Submitted by KSops on June 22, 2009 - 4:36am. Submitted by Midnightmelody on December 16, 2009 - 12:17pm. hah, i love this comic!! Submitted by Robin Goodfellow on January 3, 2010 - 4:22pm. How can any caramel be sugar free? Submitted by Samuraiartguy on March 10, 2010 - 9:34pm. Submitted by miasaki666 on August 28, 2010 - 11:45am. Submitted by Lookatme on June 16, 2011 - 4:37pm. i will even keep several pots ready just for the mornings angry customers.